Print News | In this Aug. 31, 2018, file photo, United States\' Crystal Dunn (right) prepares to strike the ball during the second half of an international friendly soccer match in Carson, Calif. Dunn is pragmatic about her shifting roles: Whatever helps get the US women\'s national team to next year\'s World Cup in France is fine with her. Dunn plays midfielder for the North Carolina Courage, which just won the National Women\'s Soccer League championship after a record breaking season. On Thursday, she moves to defense when national team opens the CONCACAF World Cup qualifying tournament with a match against Mexico in Cary, N.C. 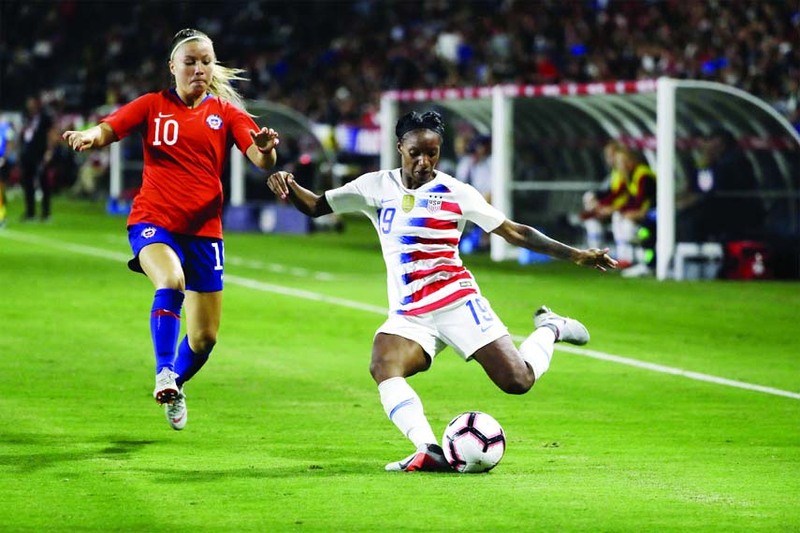 In this Aug. 31, 2018, file photo, United States' Crystal Dunn (right) prepares to strike the ball during the second half of an international friendly soccer match in Carson, Calif. Dunn is pragmatic about her shifting roles: Whatever helps get the US women's national team to next year's World Cup in France is fine with her. Dunn plays midfielder for the North Carolina Courage, which just won the National Women's Soccer League championship after a record breaking season. On Thursday, she moves to defense when national team opens the CONCACAF World Cup qualifying tournament with a match against Mexico in Cary, N.C.